Product costs have fallen and shopping habits have changed over decades. But, investment portfolio design and public policy haven’t kept up. So investors have been struggling for stability, and the Fed has been perplexed by the results of their 2% inflation target, low rates and QE. Understanding what’s broken is the step one for better investing. For parents of kids in college, your kids are living in a country where the average person is buying 2.3 times as many durable goods as when you were college-age. While durables in their dorm rooms are at 1978 price levels, their tuition and books are far more expensive than in your day. These changes are pictured on a price-quantity plot. The horizontal axis is quantity purchased per person so we can compare the size of each category. 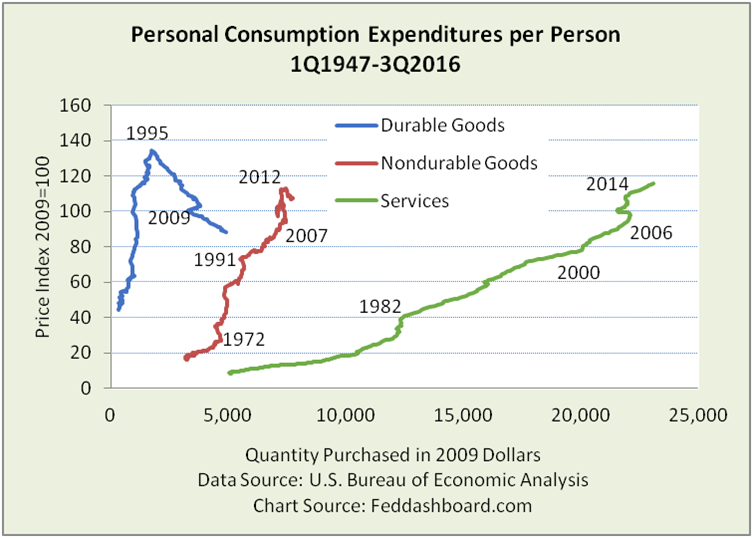 Durables (such as consumer electronics and household appliances) had little growth in purchases per person for 35 years through 1982. Then, Japan, Inc. launched a new world of durables. Products got better, prices fell and people bought more. Nondurables (biggies are food and beverages, clothing, pharmaceuticals and gasoline) have four key stories. First, products like clothing and nonprescription drugs have slightly falling prices and growing purchases. Others, like prescription drugs, gas and farm products are heavily influenced by government policy. Second, purchases tend to be population-driven, it’s difficult to eat more food or wear more socks. Third, from 2007-2012, when prices increased, people cut purchases. Fourth, product mix changed over time. Pharma went from about 2% of Nondurables in 1959 to about 18% today. Gasoline started at about 12%, peaked at over 18% in 1981 and now is 10%. Each service has its own drivers; most are far removed from monetary policy. As we wrote previously about health care, the Federal Open Market Committee (FOMC) has been fighting to raise prices while other government agencies have been fighting to lower them. For all products, we previously illustrated this with the “fan” diagram showing wide diversity in price behavior. The FOMC doesn’t seem to understand these dynamics. Thus, the 2% inflation target has no practical value as the range of prices is so wide and other drivers of product behavior are far more direct. Yet, central bankers miss this; they wrongly believe that the way to increase purchases is to scare people into buying more with the threat of inflation. Growth is good, but debt-fueled shopping is not, especially when consumer debt deleveraging was aborted as we previously showed. 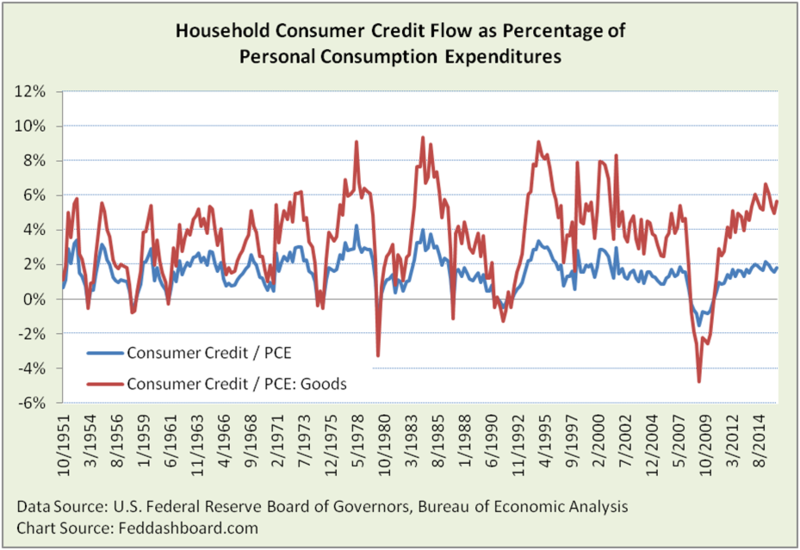 Today, consumer credit compared to consumption is on the high side of history. Considering your family, as the Veggie Tales cartoon asks, how much more stuff do you need from “Stuff-Mart” to be happy? To the extent individuals have enough stuff, how does that change a country’s expectations of quantity growth? Who can’t buy more? In a country of disparities, increasing stuff purchased by people with less will mathematically increase the aggregate average. Are new appliances, medical care and debt-fueled shopping equal reflections of economic vitality? 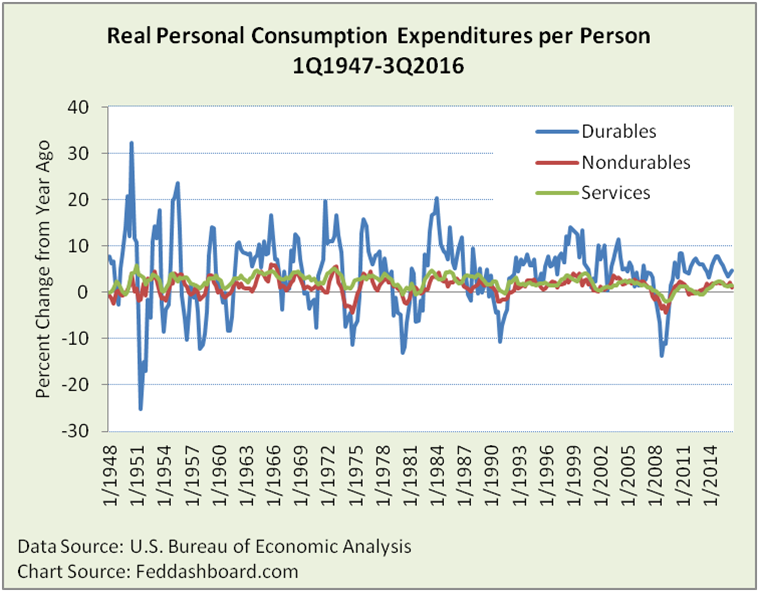 Consumers — People are much better off in durables, but hurt by price increases in some nondurables and services. Your situation determines how much you are helped or hurt. Government — Individual product prices and purchases are far more about regulatory and fiscal policy than monetary policy. Federal Reserve – To deeply understand today’s dynamics, the two open seats on the board should go to industry structure experts, technology should be one, and manufacturing, logistics or health care could be the other. To learn how to apply these insights to your business or policy initiative, contact “editor” at this website address. Any discussion of services should flag the measurement problems with non-market based services. 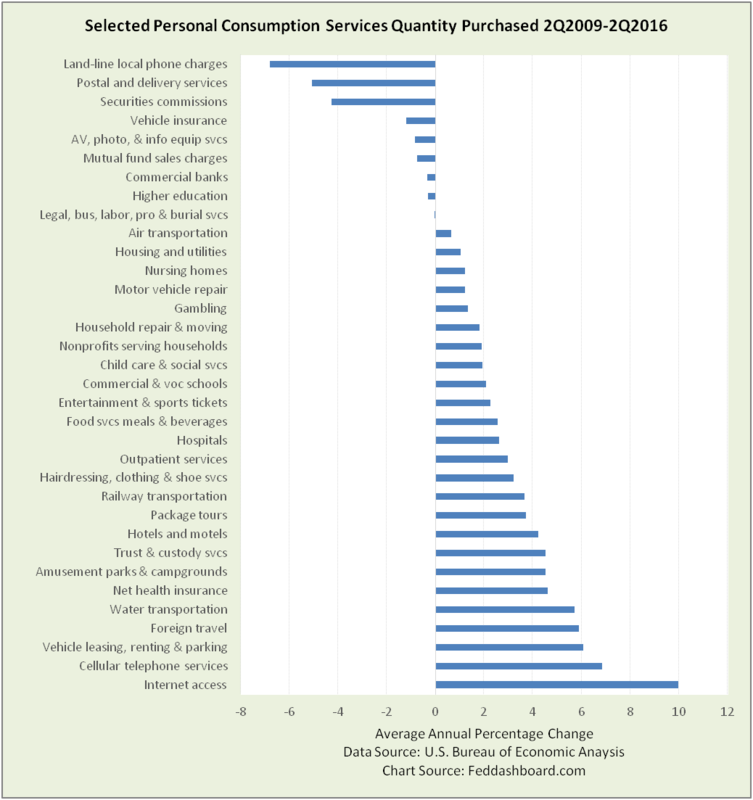 In the 1940s, services purchases where less than 70% of goods purchases; today, services purchases are over 210% of goods purchases. Credit ratios are shown to both all PCE and Goods only because consumer credit, while mostly to finance goods, is also used to finance some services such as vacations and education.